Denver, Colorado is a dog lover’s paradise! Lots of outdoor activities; off-leash parks, hiking, and cross country skiing in the winter months plus a vibrant pet-friendly downtown area combine to make Denver completely "dog-able", (that's do-able for dogs). No leashed trip to downtown Denver is complete without a visit to LODO (Lower Downtown). It's in LODO that you'll discover an eclectic collection of boutique shops, all more than happy to have four footed, furry shoppers, and a huge selection of restaurants with outdoor patio dining. Janine Franceschi and her Irish Setter Beau, noted pet travel experts have pulled together their favorite pet-friendly Denver delights for you to enjoy. Do you know the difference between a lager and an ale? I didn't, but I do now! Keeping with a casual dining theme you should also try the Wynkoop Brewing Company located at 1634 18th Street Denver, CO, (303) 297-2700. At Wynkoop Brewing Company you'll discover a huge array of brews and well mannered, leashed dogs can belly up to the outdoor patio bar while you sip a cold beer. Mix & mingle with both visiting and local pups and peeps at this great outdoor venue. See their website for additional locations. Colorado Petfitters Little Raven Street Denver, CO, (303) 825-2713 carries everything for the outdoor dog, from hiking gear to pet health food. Their philosophy is aimed at capturing the spirit of Colorado! They do this by supporting and featuring other Colorado pet companies by carrying a wide range of locally made products. Stop by this fun, pet-friendly environment and take home a little pet-friendly Denver. Another Denver shopping gem is the Livable Home. The Livable Home offers an upholstered line of pet-friendly stain and soil resistant furniture that is out of this world and chic home accessories that sneer at drool and dog hair. They are at 2510 15th Street in Denver, CO. So many dog parks...so little time! One of our favorites though was the Cherry Creek State Park which offers a delightful off leash area on the southeastern end of the park and can be found at 4201 South Parker Road Denver, CO (303) 690-1166. An exceptional luxury boutique hotel in the heart of downtown Denver, Hotel Teatro features modern day luxuries for both guests and pet-guests alike. Upon arrival at the reception area the concierge will offer to take your pup for a quick walk to the park while you check in. It is there at the reception desk too, that they keep a basket of toys for your pup to choose from as a special welcome. A lovely atmosphere and doting staff make the Teatro one of our favorites in Denver! There are no additional fees associated with bringing your pup to the Hotel Teatro however, if you ask for the 'Pets in the City Package' which does cost an additional $50, your pup will receive a very special pet amenity basket with toys, treats, pick up bags and a copy of Colorado Dog Magazine! The Hotel Teatro donates $5.00 to the Denver Friends League with the purchase of every package. Janine Franceschi, and her 3 year old Irish Setter Beau have driven 40,000 miles, visited 30 states, and stayed in hundreds of luxury pet-friendly hotels around the country! To find more information on what you can do with your pet in Denver visit PAW; Pet-friendly Accommodations Worldwide. 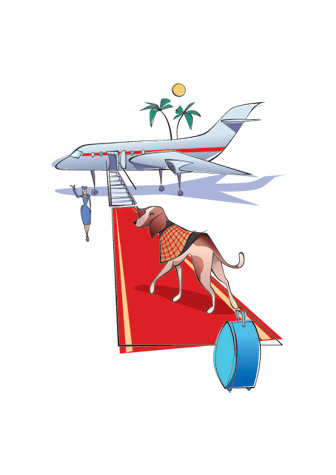 PAW is the only online pet-friendly hotel booking engine to exclusively offer luxury, (3-star or higher rated) pet-friendly hotels for booking. PAW also features a "Canine Concierge" page where you can find all the best pet-friendly restaurants, actvities and resources by city.